The American Society of Mechanical Engineers (ASME) has announced that Department of Aerospace Engineering Distinguished Professor Inderjit Chopra was selected as 2016 Spirit of St. Louis Medal recipient. ASME awards the Spirit of St. Louis Medal for meritorious service in the advancement of aeronautics and astronautics. In receiving the Spirit of St. Louis Medal, Chopra joins ranks with fellow aviation pioneers such as 1972 medalist Neil Armstrong. 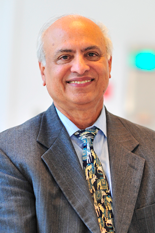 Chopra joined the University of Maryland in 1981 as an associate professor, promoted to full professor in 1986 and now directs the Alfred Gessow Rotorcraft Center. Chopra has published prolifically in the areas of helicopter dynamics and smart structures, and he has been frequently recognized for his contributions to the field. He has been working on various fundamental problems related to aeromechanics of helicopters including aeromechanical stability, vibratory loads, active vibration control, modeling of composite blades, rotor head health monitoring, aeroelastic optimization, high advance ratio rotors, smart structures, swashplateless systems, CFD/CSD couplings, motor-body-engine couplings, micro air vehicles, and comprehensive aeromechanics analyses of bearingless, tilt-rotor, servo-flap, coaxial, compound, teetering, composite coupled rotors, and circulation control rotors. During his years at Maryland, he has advised 50 Ph.D. and 90 M.S. degrees students who are themselves now playing important roles across rotorcraft industry, academia and federal labs. He was also instrumental in leading the university's efforts in pursuing the AHS Sikorsky Prize in human-powered helicopter flight which garnered him the 2012 AHS Igor I. Sikorsky International Trophy. Philip D. Ball, ASME Members and citizens of St. Louis, Missouri established the Spirit of St. Louis Medal in 1929.